This is the car that will separate the purists from the playboys. It’s been a long time coming, but the GT division has finally been unleashed on the Porsche Cayman, and the result is every bit as good as we’d hoped. In Geneva, it was wearing a loud yellow paint job so as not to be too overshadowed by the simply stunning GT3 RS. But it has nothing to fear in terms of attracting buyers. 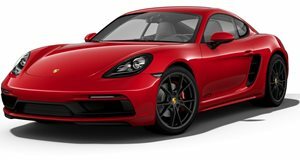 The mid-engined coupe, powered by the 385-hp 3.8-liter flat six from the Carrera S, looks to be precise, well-balanced and beautifully put together. Chris Harris takes it sideways at Portimao circuit, in Portugal, to give you some idea of just how competent this car is. While it doesn’t reach the levels of the 911 GT3, it has one thing in its favor – a manual box. And as you’ll see, this makes Harris a very happy monkey.